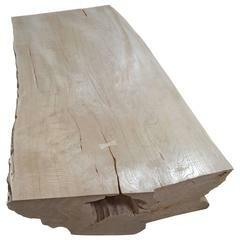 Reclaimed teak wood, live edge top with a light white wash finish, floating on modern minimalist style base. 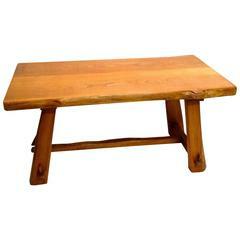 Perfect for inside or outside dining. Custom stains available. 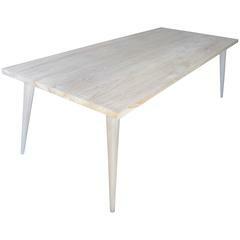 The St. Barts Collection features an exciting new line of organic white wash and natural weathered teak furniture. The reclaimed teak is left to bake in the sun and sea salt air for over a year to achieve this unique finish. Select pieces are infused with a brilliant aqua resin that is cracked to achieve a unique quartz crystal effect. The final result evokes imagery of the white sand beaches and brilliant aqua waters of the famous French Caribbean Island. Measures: 122 x 39-45? wide x 30? high x 2.5? thick x 3 slabs Andrianna Shamaris. The Leader In Modern Organic Design. 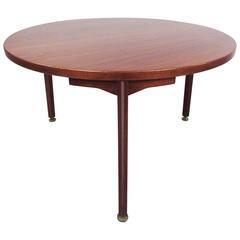 Scandinavian teak dining table curved at each end with two leaves that store underneath the tabletop total length with two leaves 94" Each leaf is 17". First edition finnish large dining room table by Olavi Hanninen and edited by Mikko Nupponen in 1958.